March Madness, an American college basketball competition, is celebrated in office betting pools and beer-soaked bars across the U.S. Although I am firmly an NFL football girl — and a Fug Madness girl — I’m also a girl that cannot resist alliteration. 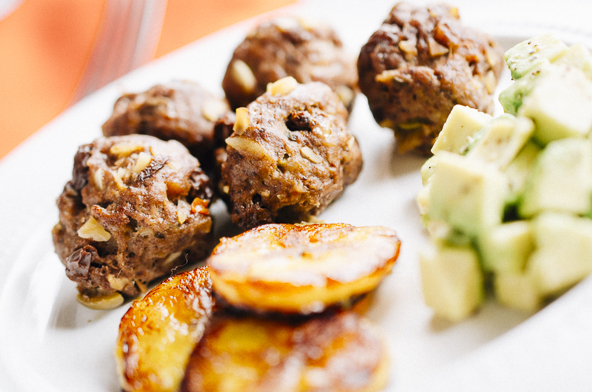 So, along with my husband Dave (tall enough for basketball but really more of a reader) and some paleo friends, I shared paleo meatball recipes throughout the month, along with a little sprinkling of basketball lingo and slang because I am also a sucker for specialty vocabulary. Go ahead! You can call me a baller. 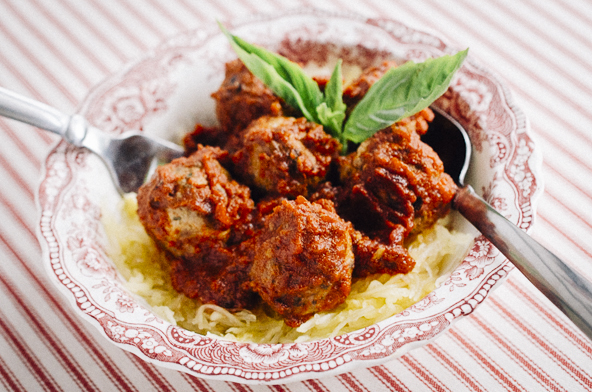 In addition to the new meatball recipes I rolled out (see what I did there?! ), I also shared a special edition of Tuesday 10 that makes the case for meatballs as the Franchise Player of your plate, explained the science behind meatball mixing methods, and offered an assist from Oven-Roasted Cauliflower Rice. Alley-oop! 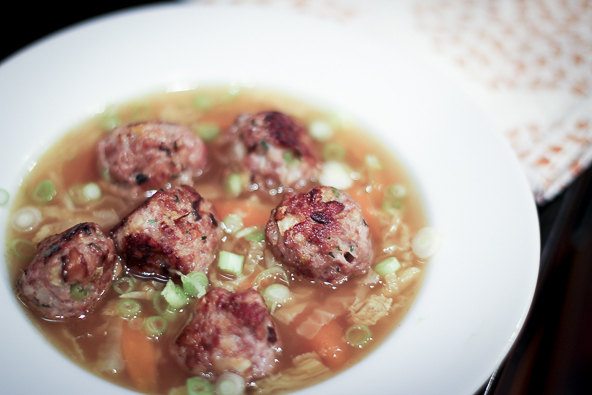 Here are some of my previously posted meatball recipes that are worthy of an all-star lineup! 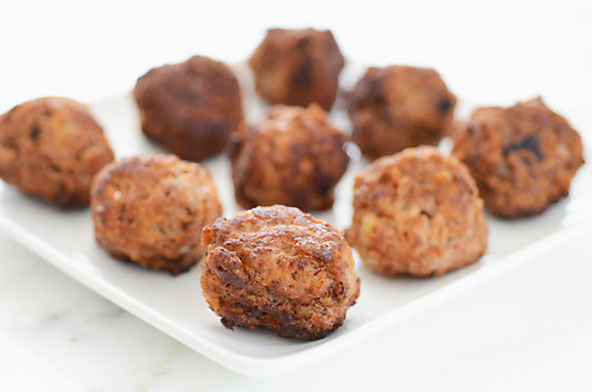 If you like meatballs as much as I like meatballs, you might want to check out Well Fed 2: More Paleo Recipes For People Who Love To Eat, which includes 15 meatball varieties, as well as instructions for cooking on the stovetop, the grill, and in the oven. 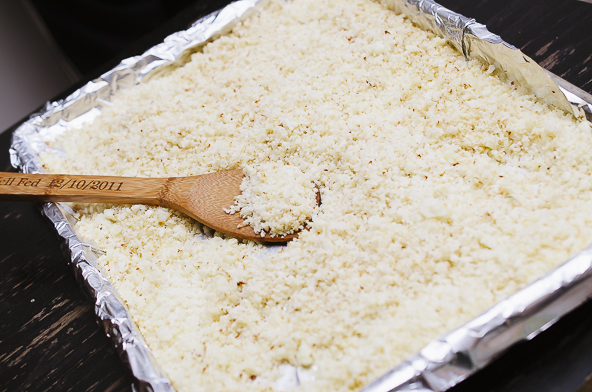 Tips on freezing and defrosting, too! So timely! 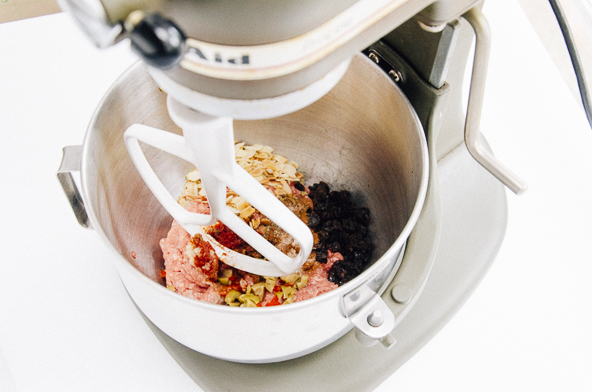 We just invested in the food grinder attachment for our stand-mixer; a month of meatballin’ will give it the serious workout out needs. Bring on the balls! I just got my meat delivery and seemed to have gone crazy on the mince (ground meat). Bring on the inspiration, lady! Oh I am so excited. I love balls. 🙂 I’ve made at least half of the variations in WF2 and uh…bacon-jalapeno burger balls with special sauce? YES PLEASE. Never before have I looked forward to March Madness, but never before has March Madness involved MEATBALLS! 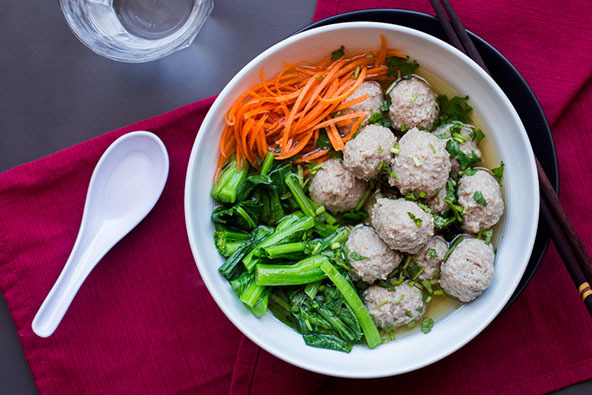 The Thai Green Curry meatballs from WF2 have become a favorite all-time meal for my husband and I, plus all 6 of my kids eat them too (even one of my super-picky ones!). I’m looking forward to some new ideas this month. I’ve also made about half the meatball variations in WF2 and they’re fantastic. The Banh mi and Italian are my favorites so far. Can’t wait for even more ideas. Thanks for doing this! 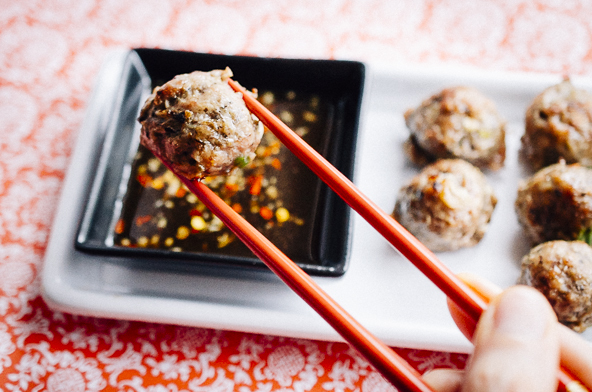 Just made these banh mi meatballs. They are fantastic. My son just told me I need to put them on our permanent rotation. And although I’ve been making a family recipe for Italian meatballs for decades, the Italian ones are our family’s new favorite. I love how varying the protein and the spices make deliciously different flavors with no extra work! Meatballs are pretty magical. I’m happy the banh mi balls were a hit! And glad that you have another Italian recipe you like. YAY! I love your Moroccan meatballs! And so does family. Yesterday I bought a lot of organic ground meat to do some meatball recipe again, since they are easy to carry and for hubby to heat when I have evening classes. I guess I’ll wait for some of the new recipes then. It might be embarrassing how excited I am to hear that it’s March Meatball Madness. Then again, maybe it just shows I have good taste! Oh how I love your balls! I’m so excited to see that it’s Meatball Madness March! I been needing some motivation to get me back on track and these will definitely do the trick! HA! Now I feel like I *do* need to create a Schwetty Balls recipe. So gross, so funny. Loving the meatball recipes 🙂 I have made Bora Bora Fireballs and Thai Green Curry meatballs so far. Both recipes were huge hits with my family! I have rekindled my excitement in cooking. Hooray! Glad you like them. Thanks for letting me know! I am so excited about finding your blog. We went Primal last year and we did great but I got so burned out cooking so much. I’ve gained back 12lbs since we kinda fell off the wagon the last six months. I can’t wait to try your weekly cook up. I’m thinking of doing meatballs instead of the stew/ chili. Any suggestion on which of these might be the most kid friendly? My almost five year old used to eat whatever we did but then we went Primal and she is having a hard time missing our old favorites. We have gotten in a bad habit of breading everything with tapioca flour for her sake. She won’t touch beef unless its my brother’s bbq brisket. I’m thinking meatballs might be the trick if I let her use her beloved chopsticks. 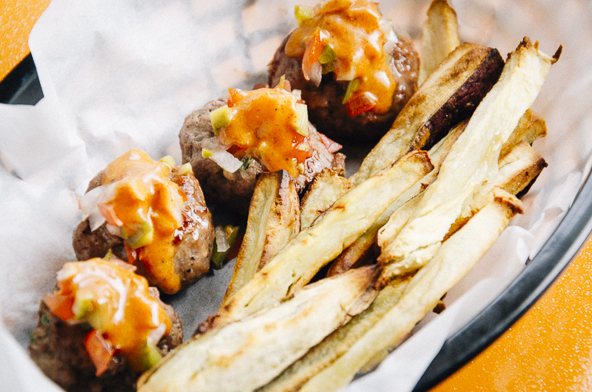 If BBQ is a favorite of your daughter, you might try beef meatballs seasoned with chili powder and paprika. That will make them taste BBQish. For 1 lb of meat, use 2 teaspoons paprika + 1/2 teaspoon chili powder. The pesto chicken meatballs are probably kid-friendly; they taste pizza-ish. …so I did not learn at home. Just finished a big plate of Bahn Mi meatballs with the Thai variation of coleslaw and spaghetti squash. No extra sauce; I just tilted my plate so the coleslaw juice leaked into the squash. Yummy! Thanks Mel. My fridge is stocked (also made Cincinnati chili) and I feel like I have money in the bank. Oh, man! I remember that cookbook! 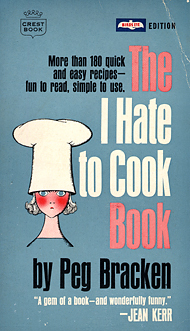 I’ve seen it in so many vintage cookbook stores… so funny! I’m so glad you’re having fun with the recipes. Your Banh Mi feast sounds awesome! And that reminds me that I should make those soon. I forgot about those! Enjoy the Chili!